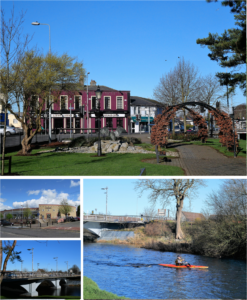 Newbridge, officially known by its Irish name Droichead Nua, is the largest town in Kildare with a population of almost 30,000. It is Kildares commercial centre and boasts plenty of great shopping facilities from the glamorus Newbridge Silverware to high street shops such as Penny’s and Marks & Spencers. The town is home to the county Arts Centre, The Riverbank Arts Centre, and the county Gaelic Athletic Association (GAA) pitch, St. Conleth’s Park on Main Street, a great place to take in hard-fought club matches. The Liffey Linear Park is the perfect place to end your day in Newbridge with a picnic and an evening stroll along the fast-moving waters. Judge Roy Beans, Edward Street. An Chistin Café & Restaurant, George’s Street. Foodhall, Whitewater Shopping Centre, Main Street.